Unfortunately the news as of late has been (to put it mildly) a little lacking with regards to upcoming handsets, but that doesn’t mean you can’t get your hands on current models for cheap! 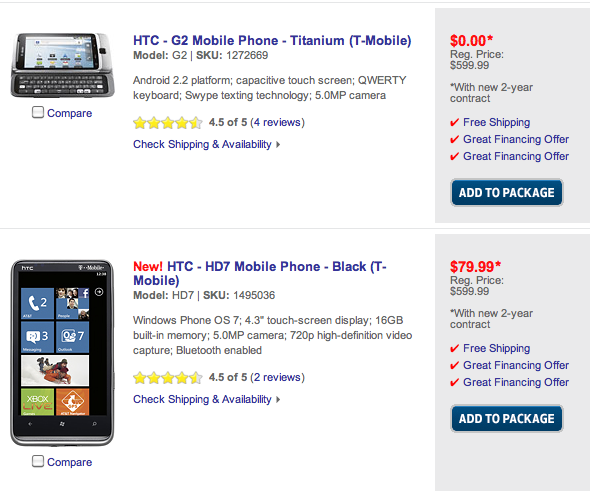 Best Buy is running its own version of Cyber Sunday/Monday with deals on the T-Mobile G2 and the HTC HD7 for new customers. Offering the G2 up for the low price of $0.00 it’s an incredibly tempting offer for anyone who has been waiting to snag this device for cheap. The HD7 rings in at $79.99 without rebate on the same new customer offering. Not a bad deal for either one of these devices if you’ve been eyeing them and definitely keep an eye out tomorrow for any deals that might possibly pop up on the T-Mobile.com site. Unfortunately, the Best Buy that’s only a mile from me doesn’t carry TMo. They have everyone else however. Is this a norm or do I have a retarded BB close by??? Yes, your BB is retarded, however… as the post above yours pointed out, this deal is a **>CYBER<** deal. Mine doesn’t have tmo, too. Well considering this is a CYBER offer, you can just order it online! Could one get the G2 and then terminate contract, essentially getting it for only 200? Yeah, that seems like too easy of a loop-hole. You’d essentially be able to pick up a $500 off-contract phone for just $200? Does anybody know what would stop people from doing this? Would it affect your credit? You would have to pay the stores early termination fee and T mobiles early termination fee. Does this have to be a NEW contract or can I add an additional line to my family contract with a new data plan to get these phones at these prices? You will have to call the toll free number for Best Buy mobile to find out. Can’t add a line online. Price is $119 for contract extension. A phone’s price never, ever rise after they are released. Especially a phone that stared with outdated hardware specs. Get a clue. i believe he was referring to the rise of windows phone 7, josh durrrrrrrrrrrrrrrrrrrrrrrrhh. 7If you guys were in South Florida you could get the HTC HD7 for 50.00 at BrandsMart.